Panko is a variety of flaky bread crumb used in Japanese cuisine as a crunchy coating for fried foods, such as tonkatsu. Panko is made from bread baked by passing an electric current through the dough, yielding bread without crusts, and it has a crisper, airier texture than most types of breading found in Western cuisine. White Panko is made from bread which has had the crusts removed while tan “Panko” is made from the whole loaf of bread. Outside Japan, it is becoming more popular for use in Asian and non-Asian dishes, is often used on fish and seafood, and is often available in Asian markets and specialty stores. Increasingly, it is also available in many large supermarkets. In February 2012, the U.S. fast-food chain Wendy's introduced a cod fillet sandwich that they advertised as having a panko breading. Panko is produced worldwide, particularly in Asian countries, including Japan, Korea, Thailand, China, and Vietnam. For all the moms out there. Happy Mother's Day! Do you like to cook with panko bread crumbs? Combine mayo and rosemary, chill until ready to serve. In a dish, add flour. In the second dish, add eggs and water, beat. In the third dish, add panko bread crumbs and paprika, mix well. Season chicken with salt and pepper. Dip chicken in flour, then dip in egg, then dip in panko bread crumbs. In large skillet, heat oil over medium heat. Place chicken in skillet, cook about 6 to 8 minutes, each side, until chicken no longer pink. To assemble, spread a dollop of mayo on top and bottoms of the buns. Place chicken on bottom half of the buns. 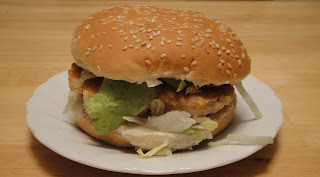 Top with lettuce, then add top half of the bun. Enjoy! Thank you! Happy Mother's Day to you! This sounds like a fantastic sandwich, Christine! Yum,,,,rosemary mayo on this sandwich sound really tasty !! Looks yummy Christine! I love flavoured mayos too.. and rosemary is divine with chicken. I love panko crusted chicken! What a beautiful sandwich! Panko is definitely a favorite of mine. It adds the perfect amount of crunch! Electrocuted bread.. now that's a new one to me!! :) Nice aromatic mayo too. A.
I use panko in a lot of my cooking. I love the crunch of it!! Crunchy coated chicken and cool rosemary mayo... ahhhh. Thanks, Christine!